As I sit here listening to the rain outside my window in Copenhagen, I am staying warm and dry by prepping for next week’s classes. I have a great mix of international students who have given up their summer to explore new frontiers in business. Staying ahead of them is keeping me busy! I am always amazed at the insights to be gained by crossing interdisciplinary boundaries. The business professors also come in from all over the world and our lunch and dinner conversations keep ideas flowing. I think the beer in Denmark has something to do with it! This week our focus in advanced market research at CBS is on Aristotle and social innovation (phronesis). “Telling the story” is the job of marketing in the world of business. And exploring new markets gives ample opportunity for developing a new story. Hopefully – to change the ending of our current economic tale. As a reference guide, Aristotle’s Poetics for Screenwriters is an invaluable tool that works equally well for strategists. In order to gain competitive advantage, you need to go where other people are not (remember Blue Ocean Strategy)? Michael Tierno has done a masterful job of walking the reader through the best of Aristotle. Whether or not he realizes it, Tierno has also done a masterful job of walking the reader through the complexities of experiential marketing. The principles are the same: engage your reader – engage your customer. Create a memorable experience. A story worth telling. A story worth remembering. If you need to insert some new life into the ‘story’ of your business, here is a worthwhile primer. And you get a little philosophy lesson as a bonus. Contemplation for the beach perhaps? You can bring the beer. I waited a long time for this baby. Lee Sheldon has come out with his second edition of a fabulous resource book on character development. I know it says for games. You may not be a gamer, but if you ever construct a story – then this book deserves your attention. Storytelling is a discipline and as a discipline, it has some basic structure that is the difference between a good and a great story. The same holds for developing characters. So if you are building personas in scenario planning or marketing, this book is a great guide. If you are thinking of working with transmedia, then this book is invaluable. When you read this review, I will be starting a new course in marketing and storytelling at the business school in Copenhagen. Reviews over the next 6 weeks will be done in one of the oldest schools in Europe. Museums, cafes, architecture and great food are on the agenda. I’ll keep you posted. Terry Pearce followed his heart and went back to school – something dear to my heart. Even better, he was drawn to the same program that I took a few years back – a PhD in comparative mythology and depth psychology. In his studies, he explored what it meant to lead across cultures, deepening his understanding of why people do what they do. I know I am biased, but, I believe no better preparation for the complexities of our current global world of business. Pearce first published “Leading Out Loud” in 1995 and it quickly become a classic in the field. In this third edition, he expands on the reflective work necessary, no demanded, by authentic leadership in order to inspire commitment and action. He asks the question ‘where do passion and commitment reside’? Answer: in inspiration – and this book will act as both guide and nourishment for the journey to the authentic Self. Pearce has taught leadership communication at UC Berkeley, the Haas School of Business and the London Business School. He draws upon a wealth of experience and adds a deepening of perspective in the authentic leadership model. A worthy addition to your reference library. Keith Sawyer has a lot to say about creativity and I find myself listening closely. He has a great academic pedigree and is a jazz pianist, does improv and writes games. So … he practices what he preaches. He focuses on some key questions – how can each person be more creative and – how can the organization work together to translate individual creativity into organizational innovation. As that is my primary area of research, I dove into this book. It seems that most books on creativity have steps or stages attached 🙂 I guess it comes with the territory of attempting to harness the creative impulse into something that we all can both understand and replicate. Psychology has been studying creativity for decades and one thing we know for sure – these stage models work. Creativity is a non-linear process which is why there are so many ways to explore the creative impulse. It usually does not descend like a bolt of lightening – but instead responds to constant tending. This book is like a personal trainer for the creative impulse. Interesting exercises that can be done daily. Practice makes perfect! and it takes a lot of practice (10,000 hours according to Gladwell) to become an expert where you are comfortable in your own skin. 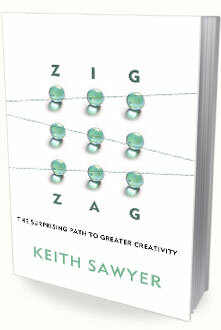 The thing I like most about this book is the emphasis on creativity as a discipline – you do it every day. The more you practice the process, the better the results, the faster the ideas, and the easier the implementation. Just like learning how to drive – learn the process until it becomes automatic. Steps are: (1) Ask (2) Learn (3) Look (4) Play (5) Think (6) Fuse (7) Choose (8) Make. Similar to many others but again different. Some great exercises, quizzes and lots of stories. An easy fun read. At Nike, all senior executives are designated “corporate storytellers.” 3M banned bullet points years ago and replaced them with a process of writing “strategic narratives.” Procter & Gamble hired Hollywood directors to teach its executives storytelling techniques. Scenario planning (or storytelling in multiple forms) is now a highly effective form of strategy. And if you are in my faovurite transmedia space, well … I don’t have to tell you about the power and profitability of narrative. The rest of North America is slowly catching on to what successful global organizations have been using for years. Business schools are beginning to add storytelling to coursework. I use story and build storytelling into every course I teach – strategy, competitive intelligence, consumer behaviour, marketing – all benefit from the use of the best communication tool ever invented. Start your New Year off by joining a movement that is both instructive and fun. If you want your organization to prosper in 2013, why not increase your competitive advantage? Sometimes, the old ways are the best.